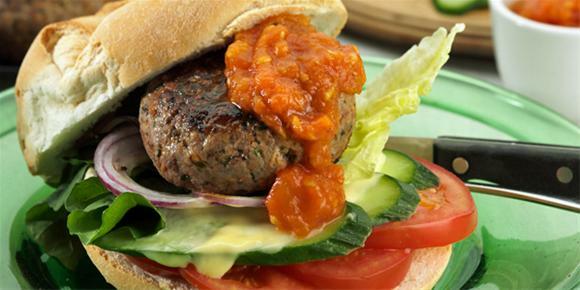 Combine all the ingredients for the burger together and gently slap together to form a cohesive mixture. Shape into 200g discs and chill for at least 30 minutes for them to firm up and cool down. Preheat a heavy pan or BBQ and lightly oil the surface. Cook the patties for about 10 minutes turning twice and allow to rest for three minutes before serving. Chop the tomatoes using the Braun Multiquick Cordless chopper. Warm the olive oil in a frypan and add the garlic and thyme. Now add the tomatoes and cook gently until they have broken down and their excess water has evaporated. Season with salt and pepper and add a little sugar to taste if required. Blend to a smooth consistency using the Braun Multiquick Cordless hand attachment.